The Humpbacked Witch Statue, actually a statue of the healer Gunhilda of Gorsemoor, is a Minifigure found only in 4751 Harry and the Marauder's Map. The statue resembles the Chess Queen. They both have a slanted piece for a dress and are not actual people. The statue has grey arms and hands, and a greenish-grey robe design. The head is blank and grey as well. The statue is most known for hiding a passage from Hogwarts Castle to Hogsmeade. To gain entrance to the passage, one must give the password; Dissendium. The hump on the witch's statue then opens to reveal a short slide into a tunnel which leads under the school. Then a person may travel on foot to reach to Hogsmeade, specifically inside the basement of the Honeyduke's Sweetshop. 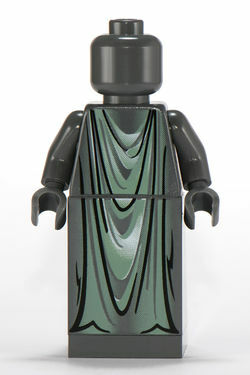 However, in the LEGO set, rather than the back of the statue opening up, a trap-door beneath it would open. It does not appear in LEGO Harry Potter: Years 1-4. However, there is a resemblance to a one-eyed witch statue. Facts about "Humpbacked Witch Statue"